Inspired by this delicious recipe for laboo va mast, or Persian beet and yogurt, from Fig and Quince, I bought a bunch of beets over the weekend. Before I started cooking, I used these gorgeous roots as models for the sumi outlines. I took several perspectives — looking at the beets from the bottom, the top, as a pair. And towards the end of my drawing session I ended up with several cards that were sort of cartoon-y, like the one at the start of this post. The heart shape that dripped from my brush was accidental. The pun “heart beets” was completely intentional. For the rest of my cards, I must admit: I stole wording from Fig and Quince’s post. 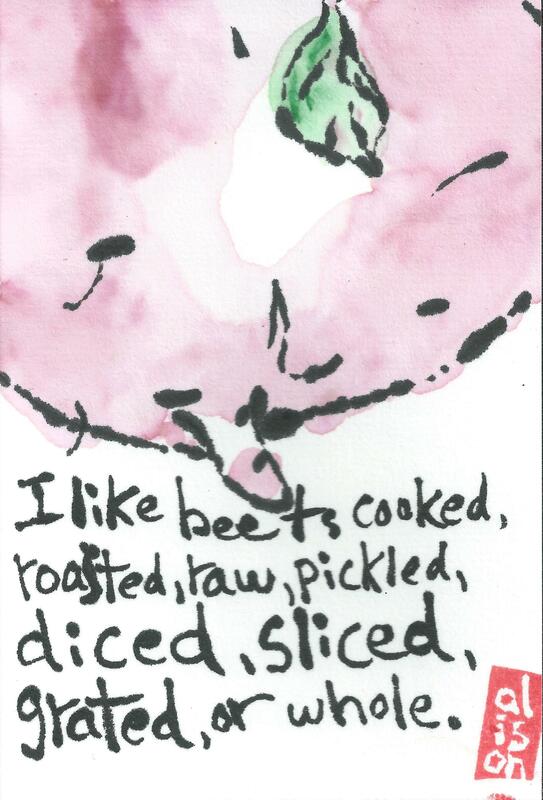 Exhibit A: Her opening line “Some people are immune to the allure of beets. 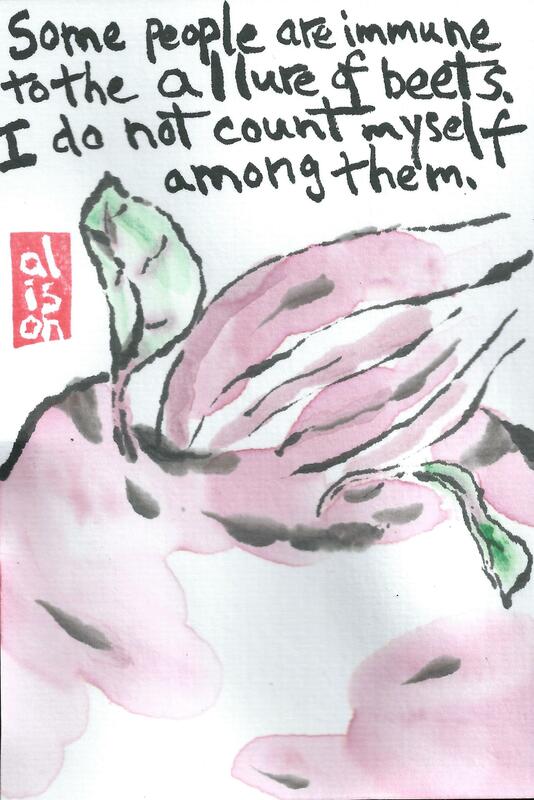 I do not count myself among them.” Me neither. Then, after drawing the sumi lines, I got down to cooking the recipe. Well, “cooking” makes it sound like it was more work than it was. 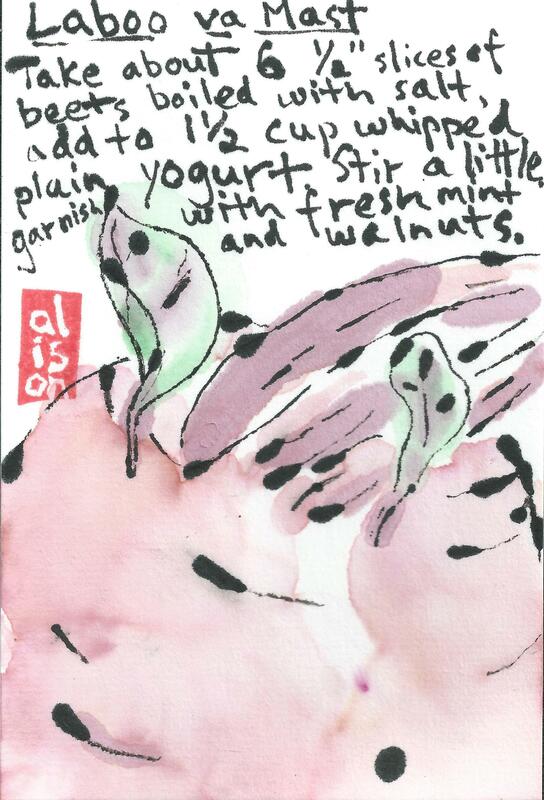 Below is my abridged recipe, enough for one person, on an etegami card. I used 2% Greek yogurt. And instead of walnuts I used pecans — it’s what I had and sprinkled the mint in before I put in the beets. Next time, to ease the mixing of the beets and the yogurt I’ll probably slice the beets into 2 inch slivers. A final word on color — I usually draw the sumi ink lines first, take a break and go back to color my cards. This break was particularly fruitful because in the interim I had cooked up the beets and remembered what vivid jewel red color they have. So I brought some slices down with me to use as color. The bottom three are painted almost entirely with the red from the beets. 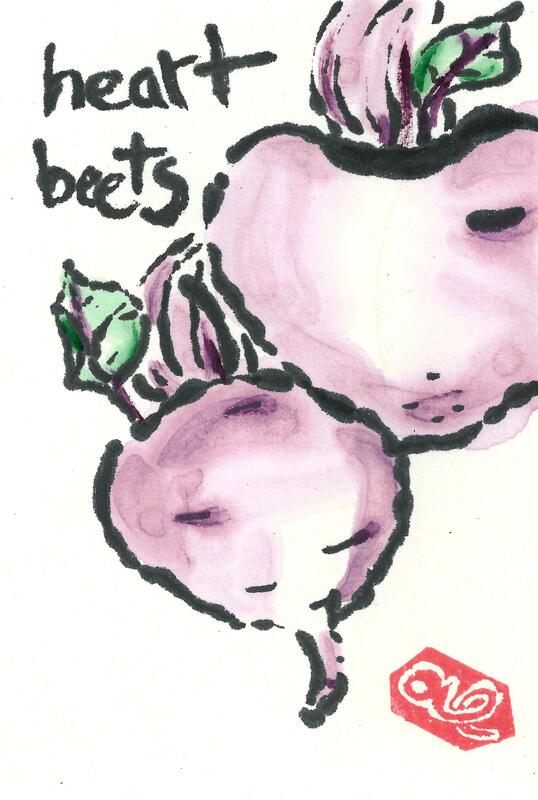 The top one, Heart Beets, uses gansai watercolor. I am worried that the ones with beet juice will breakdown and either become brown, or fade too much. But, I just have to remember, the beet goes on. Thanks so much, thank you for the inspiration! So far the color has held. But of course… it’s only been 5 days! Hi Shirley! The recipe is from a blog called Fig and Quince. The recipe itself is just beets and yogurt and mint and nuts!